Winco-BCS-3 Stainless Steel Bell Creamer 3 oz. Improve the look and quality of your hot beverage service with the Winco-BCS-3 Stainless Steel Bell Creamer 3 oz. An indispensable tabletop accessory for diners, hotels, restaurants, cafeterias and coffee shops, this charming creamer has a slightly rounded body, a comfortable handle and a carefully designed pour spout that directs milk or cream straight into the customer's cup. 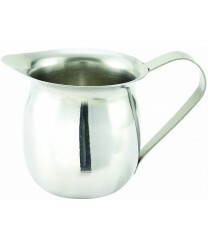 With its classic mirror finish, this petite creamer will complement any coffee serviceware collection.